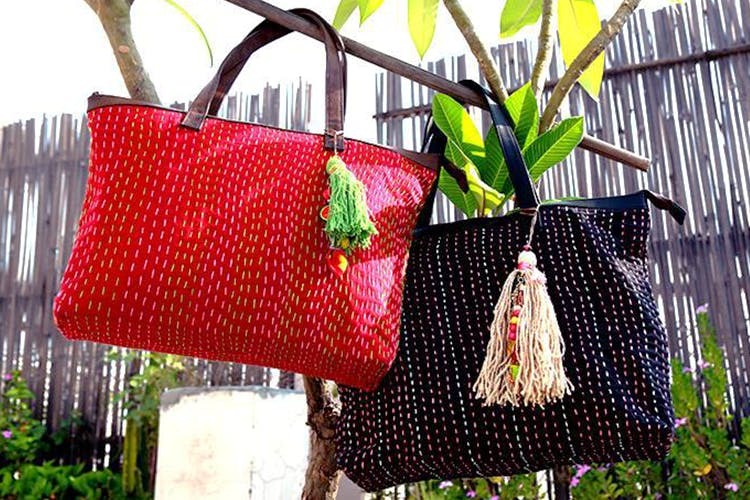 Molcha has an amazing range of handbags in fabric, cotton, embroidery, weaves, and more. They've got an offbeat traditional element attached to them. While Molcha does everything from kurtas to shrugs, their handbags steal the limelight. They've got their own unique brand of style and design when it comes to these bags. You'll find anything from a block-printed kalamkari print and kantha embroidered cotton sling bag in multiple colours to handwoven laptop bags in canvas. They've also got backpacks in bold colour schemes like indigo-red, brown-maroon and more. The price range starts at about INR 1,000 which we feel is quite reasonable. They don't have their own website that you can browse through their catalogue on –we wish they get one soon.